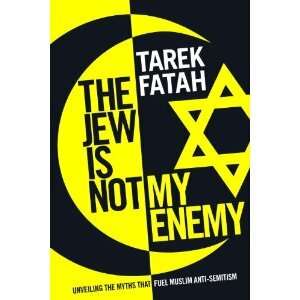 When I was asked to participate in the Green Books 2010 Campaign by publishing a review of a book printed on environmentally friendly paper today, I chose The Jew Is Not My Enemy: Unveiling the Myths That Fuel Muslim Anti-Semitism by Tarek Fatah from the list of books offered to me for review. I have not seen many books written by moderate/liberal Muslims speaking out against the extremist acts of a few, so I thought it would be an interesting read. And it is. Tarek Fatah, a Canadian of Pakistani descent, is a journalist and the founder of the Muslim Canadian Congress, a liberal group. In his introduction to the book he says that he is on a jihad against Muslim anti-Semitism. Prior to the terrorist attack on Mumbai in 2008, the small Indian Jewish community had not been the target of anti-Semitic attacks. The fact that the terrorists came from Pakistan, which has no Jewish population, horrified Fatah and inspired him to write this book about the origins of Muslim anti-Semitism. Fatah relates the history and development of anti-Semitism in Islam', and the factors that encouraged it from the Qur'an to the policies of the modern state of Israel. The purpose of the book is more to persuade his fellow Muslims that anti-Semitism is not a core tenet of Islam than it is to make an apology to non-Muslims. Fatah makes a distinction between the authority of the Qur'an and the writings of the Hadith in order to make his point. He also argues that the creation of an independent Palestinian state would help reduce Muslim anti-Semitism. I am not familiar enough with Islam or the history of the development of anti-Semitic attitudes in its theology or in the cultures of the countries where it is widely practiced to know whether or not Fatah is making a persuasive case to other Muslims. I do appreciate the courage that it must take for him to take on this subject in a very public forum. I will give away my review copy, so if you are interested in reading this book leave a comment here! I would like to see a copy of your review for this book. If you could kindly sent it to cutiepie567@hotmail.com that would be greatly appreciated. Did you mean that you would like to have my review copy of this book? If so email me (jody dot harrington at gmail dot com) your name and mailing address and I will send it to you since no one else has requested it.